Posted on December 5, 2013	by Smiling Road Warriors! Mr. Sothy, our guide for the morning, took us for a memorable trip to his village. 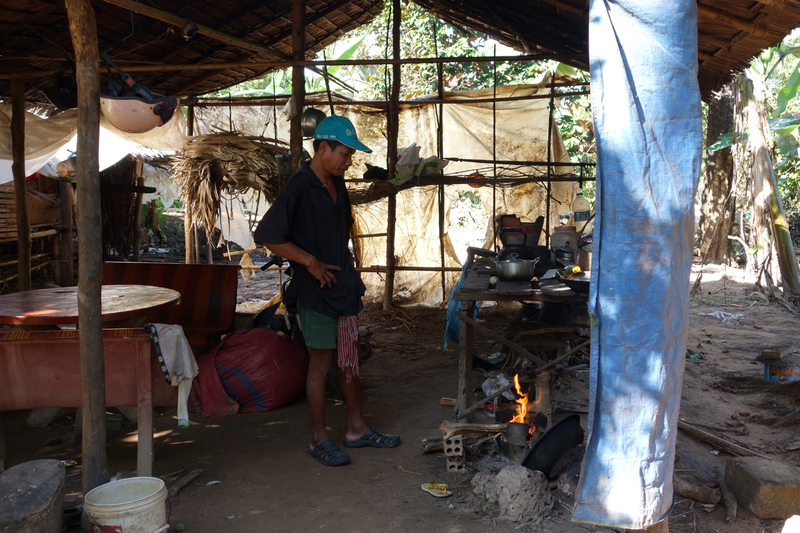 He is not a “certified”, official guide, but provides this one tour of his village when requested by JW, to show just what village life is like in this part of Cambodia. Roughly 85% of the country consists of rural farmers. 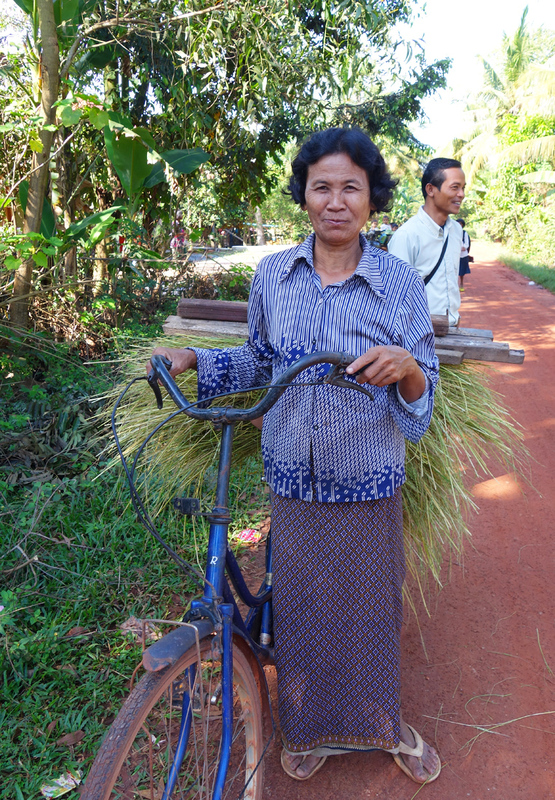 We drove out of Siem Reap for about 45 minutes to an hour, until we came to a dirt track that serves as the ‘main road’ back to his village. From this road we walked a few miles, viewing countless small homes, rice paddies and little shacks selling everything from bottles of gasoline (usually in old whiskey bottles! ), to a can or two of warm coke, and often small candied treats popular with children walking the track home from school. 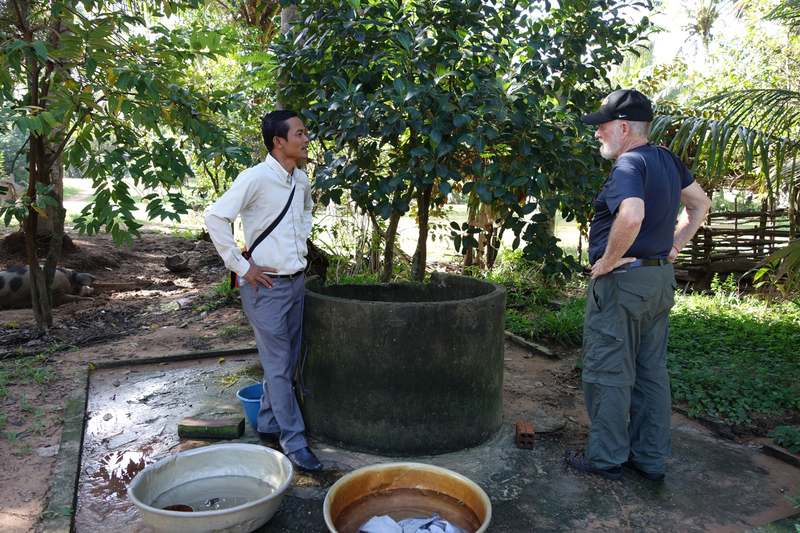 We stopped along the way at several homes and met some of Mr. Sothy’s friends, relatives and neighbors. 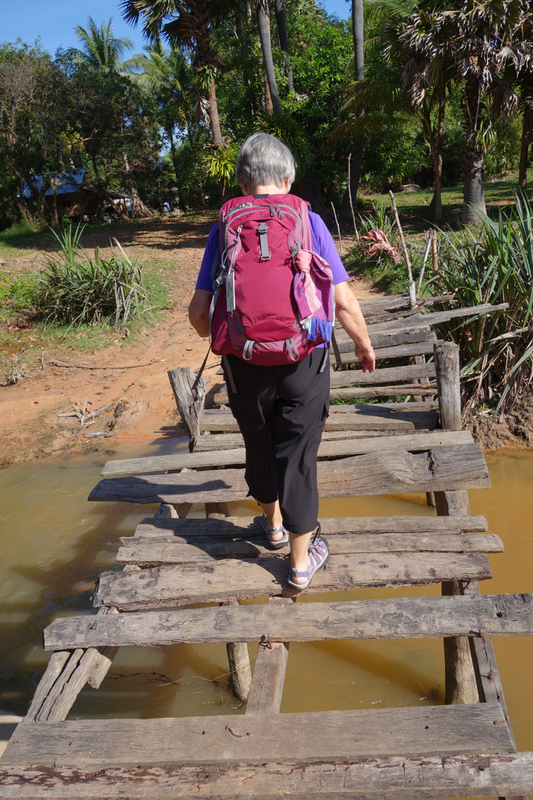 There was a rickety wooden bridge over a creek that we needed to cross to get to his home (see image). He wasn’t sure we would do it: he was showing his village to some people few months ago that, after looking at it, decided to cross through the water. For me, I choose the bridge–sure glad I had been doing balancing exercises at the YMCA this past year! 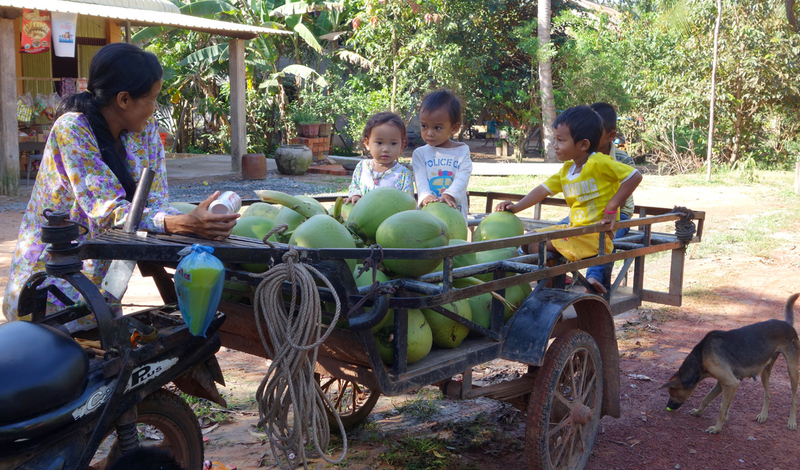 Sothy was raising his three children as a single dad with the help of his mother. The extended family lives together in a single-room home built on stilts. This is the predominant structural technique here, to avoid the annual flooding of the low-lying land. We met his son, niece, sister and mother. His other children were at school. 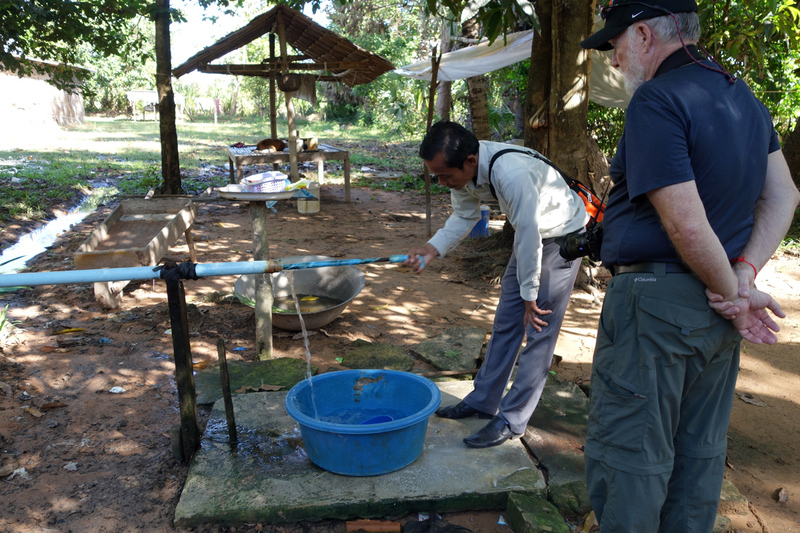 The village had been helped by some international aid to develop small, individual, clean water systems. He was very proud of his, and wanted to show us how it worked! 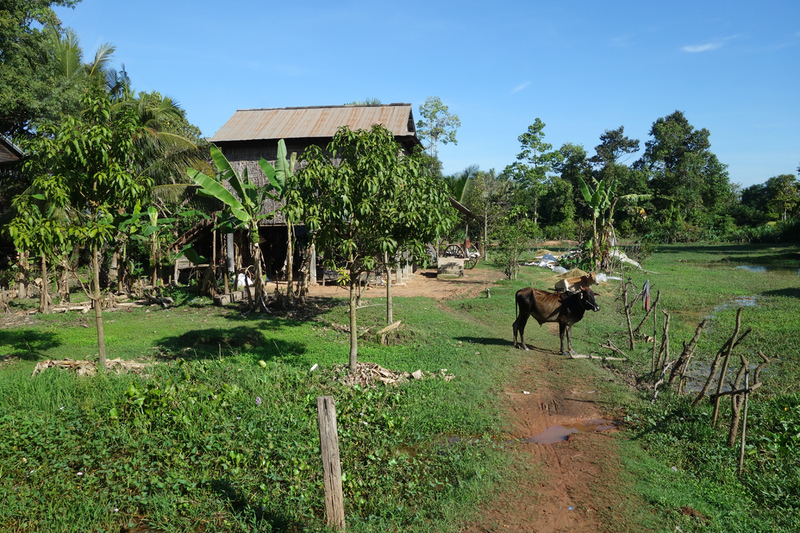 The small rice fields attached to many of the small homes were doing reasonably well this year; but in 2011 they had so much rain much of the crop was lost and everyone suffered. 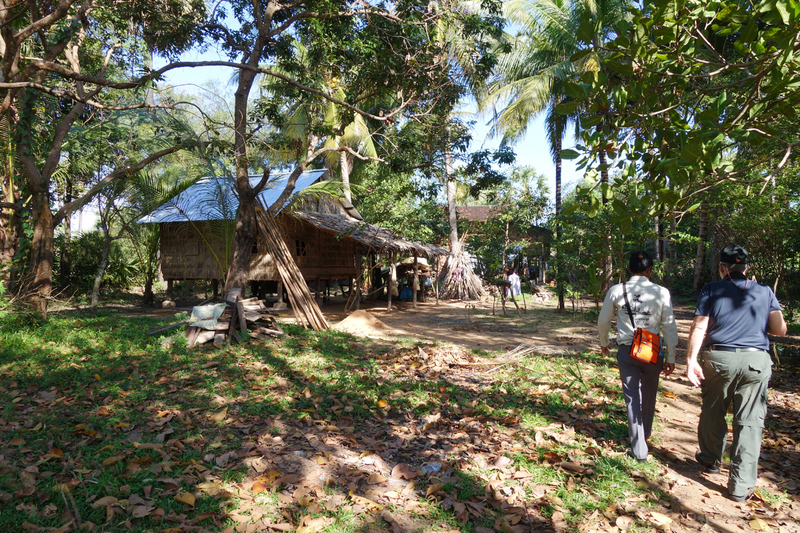 As families’ incomes increase they would choose to build a home with wood or stucco, but most still had the traditional thatch homes (wood is VERY expensive, and they scavenge any and all scraps for this eventual “build” endeavor). In all, a fascinating glimpse into the routines and lifestyle of these hard-working, gracious people. It was a privilege to have met Sothy and his villagers! Pond created to soak Gum-Tree logs for house construction, and also for growing lotus flowers. Our Guides Aunt from his village; heading home with a load of hay for the cow. 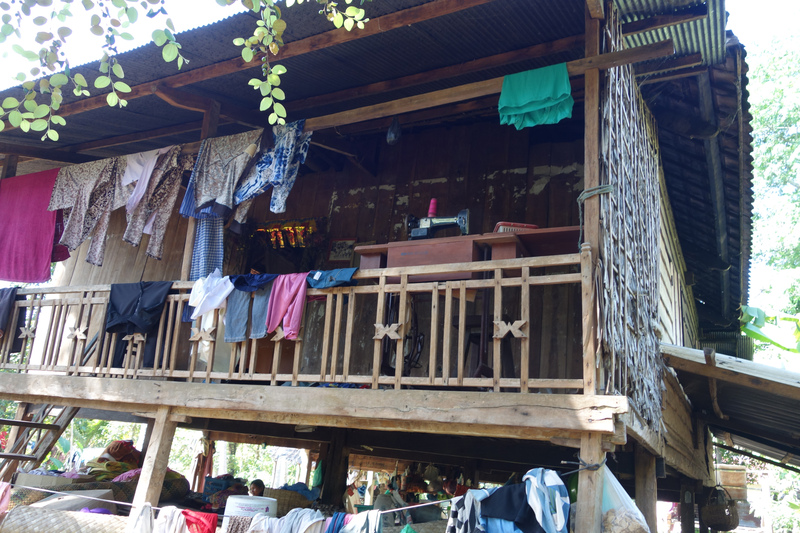 A very poor structure that serves as a kitchen-family area for a small family. Young proud father with first child. Belongs to dwelling picture above. 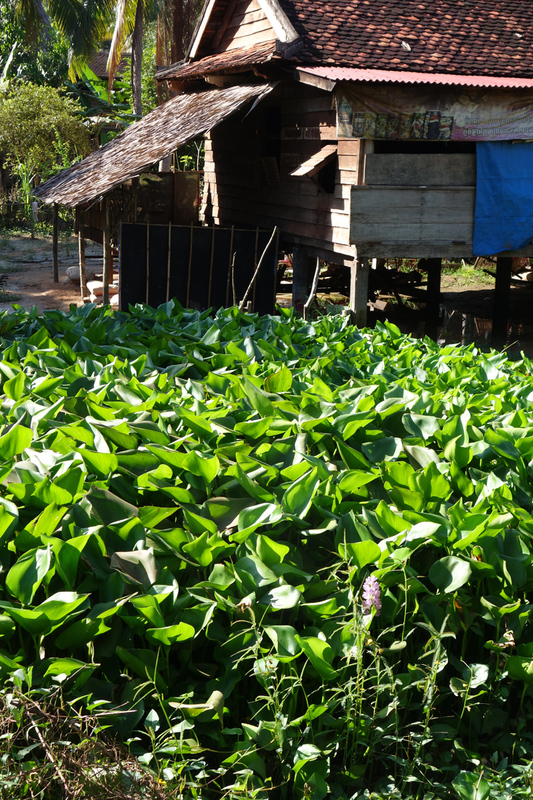 This family has a pond brimming with water hyacinth, which they sell for both food and flower. Saw kids trying to catch frogs in here on a pole with fishing line. 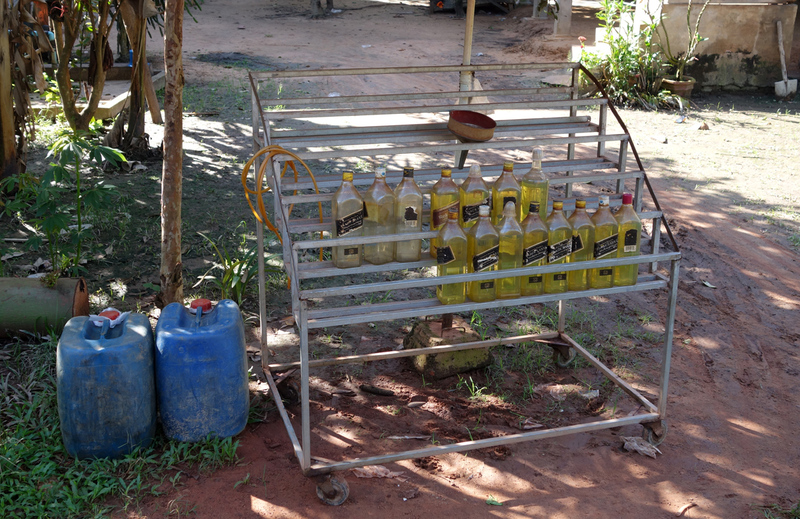 The village gas station – -Johnny Walker Black label in your tank! You see these everywhere, even out on the main roads. Stalled on the way to market some fresh coconuts. Dad’s under his motorbike with a piece of a tin can trying to fashion an electrical connection. Walking a track with our guide back to his area of the village. The Sothy family dwelling. During the day, everyone seems to spend their time underneath the main structure – -much cooler there. Old hand-dug well. Only good for the pigs and cleaning things. New Well! Works by plunging the pipe in and out, forcing the water up. very clean and efficient. 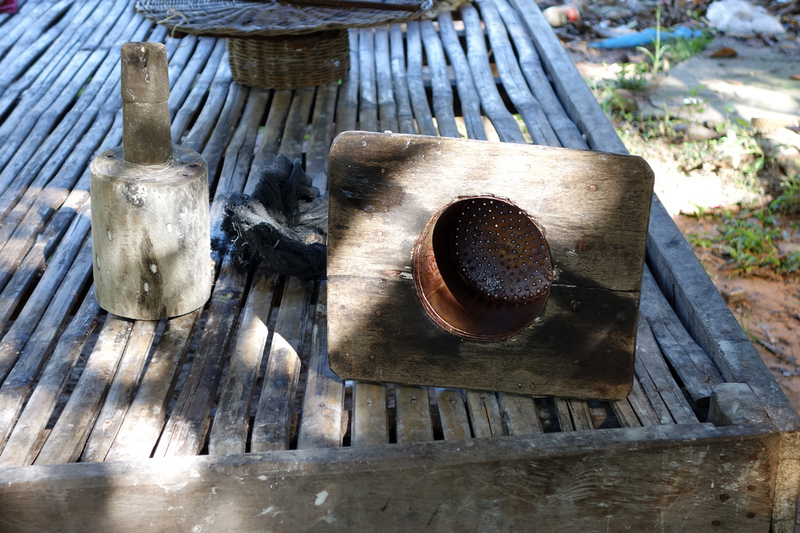 Sothy’s mother makes noodles from his ground flour, heats the dough in boiling water, and forces it through this homemade tin can used as the noodle-maker. 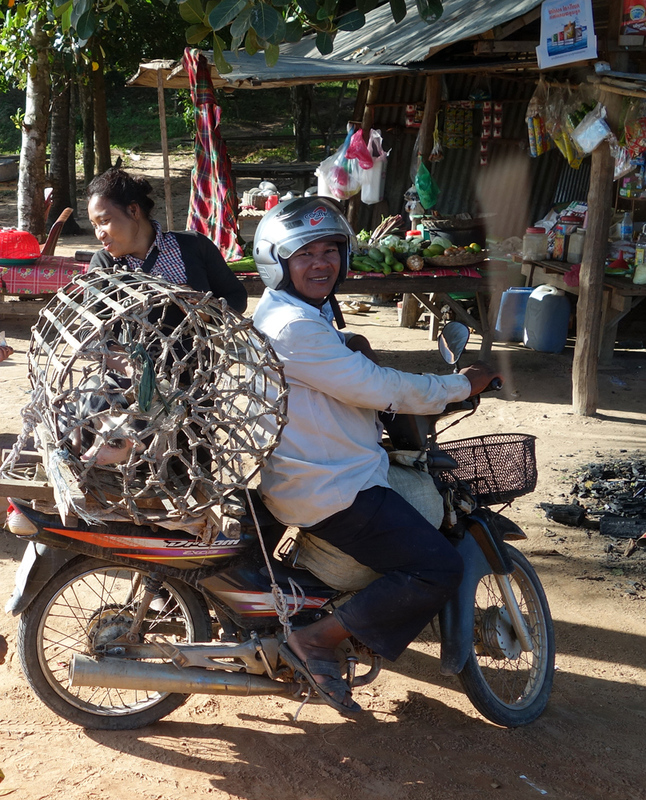 Then down the road quickly to market.